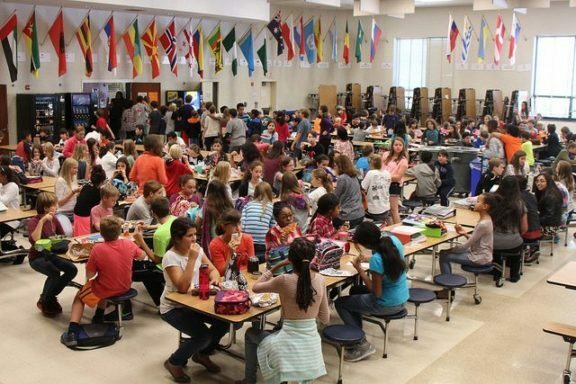 “public middle school lunch” by woodleywonderworks. The troop numbers for Girl Scouts of Greater New York are determined by the city’s five boroughs, with the 1000s in the Bronx, 2000s in Brooklyn, and so on. Giselle Burgess is the leader for Troop 6000, the newest addition, but you won’t find Burgess’s troop on a map of the boroughs. Troop 6000 is the first in New York City designated solely for homeless girls. Currently, the troop’s members—21 and growing—live at the Sleep Inn, where the city has taken over all 10 floors to accommodate about 100 homeless families. The New York Times reported that the new troop is among several programs supported by the city to meet the needs of children, who make up nearly 40 percent of the roughly 60,000 people in the city’s primary shelter system. Of 287 people housed at the Sleep Inn, 155 are under 18, according to homeless services. Troop 6000 emerged from a collaboration between Girl Scouts, the homeless services department, and Councilman Jimmy Van Bramer of Queens, who himself experienced homelessness as a child in the 1970s. The city has been trying to move away from a well-criticized history of haphazard patchwork of placement for homeless families. Families are sometimes placed far from the zip code where they lived for years, leaving families without support systems and saddled with impossible commutes to school and work. Such moves also sever children from social activities. Burgess, the community engagement specialist for the Girl Scouts, moved the idea forward and set up the first meeting. She is herself homeless and has an all-too typical story of modern housing insecurity. Her affordable rental house was sold to make way for an upscale condo project; she found herself employed but unable to afford housing for her family. They landed at the Sleep Inn. Studies and client feedback have shown that hotel living for the homeless is not as ideal as a traditional house or apartment. Living without kitchen facilities makes it nearly impossible to eat healthy on a budget, and lack of privacy leads to other concerns. The troop has been a positive experience for Burgess’s daughters and may others at the hotel turned homeless shelter. Meanwhile, in Connecticut, the United Way of Western Connecticut (UWWC) announced they have directed $100,000 in funding this year to assist qualifying families in offsetting the cost of out-of-school enrichment programs for their children. The ALICE (Asset Limited, Income Constrained, Employed) Enrichment Fund came about after the board acted on extensive stakeholder feedback. “We heard overwhelmingly in our conversations with parents that a top concern is their inability to pay for enrichment activities for their children—such as sports, music and the arts,” said Kimberly Morgan, CEO of UWWC. The ALICE Enrichment Fund provides families who fall within its income category with scholarships for their children to participate in skill-building extracurricular activities. Relieving the stress from parents who feel guilty about not being able to provide afterschool enrichment to kids while keeping school-aged children busy, engaged, and mentally stimulated is clearly a win-win for the community, who will see the benefits in reduced teen pregnancy and drug use, if the statistics bear out. The nonprofit found an all-star advocate in State Senator Michael Padilla. The New Mexico Democrat and State Senate majority whip said he introduced the bill because he grew up in foster homes and experienced shaming tactics as a child. He still remembers the names of school lunch ladies who were kind to him, Mrs. Ortiz and Mrs. Jackson, but told the New York Times he still had to do things like mop the school cafeteria floor. “It was really noticeable that I was one of the poor kids in the school,” Padilla said. On April 6, 2017, the governor, Susana Martinez, signed the Hunger-Free Students’ Bill of Rights, which directs schools to work with parents to pay their debts or sign up for federal meal assistance and puts an end to practices meant to embarrass children. It applies to public, private, and religious schools that receive federal subsidies for students’ breakfasts and lunches.